Ray's (Casey Affleck) eyes tell their own story, more hauntingly and more urgently, than any of the plot's clunky machinations. Casey Affleck looks exhausted for the duration of The Finest Hours, and for good reason. Again and again, Affleck's Ray Sybert, engineer aboard the doomed oil tanker Pendleton, is called on to perform all manner of miracles, first by a stubborn captain, then by a monster winter storm that breaks the tanker in two, and at last by a crew that wants him to save them as well as a loud minority of that crew that rejects his efforts. Adapted from a book by Michael J. Tougias and Casey Sherman, which recollects a true event off the Massachusetts coast in the winter of 1952, the film lays out Ray's tough position in a way that recalls that of Scottie on assorted Star Treks -- pushing the engines he knows so well, pushing back against the impossible demands swirling around him. While Scottie typically appears comedic, however, here you see in Affleck's signature weariness, his capacity for pain, another perfect incarnation of the put-upon worker, toiling for a master who has no idea what's at stake, what's possible, or what's coming. You know that Ray knows all this, even when he doesn’t say so. His frustration, his wisdom, his infinite patience, his moral focus, all mirror yours, or at least, yours if you were as nearly as noble and knowledgeable as he is. 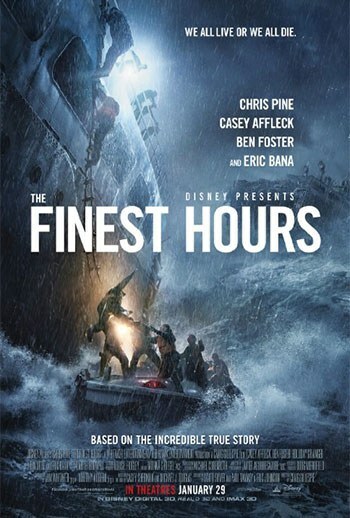 Yet, as compelling as Ray might be in The Finest Hours, as much as you might want to watch and connect with him, much of the film is given over to his counterpoint, the other most noble soul on screen, Coast Guard sailor Bernie Webber (Chris Pine), who is called on to save Ray and his crew. Bernie is by definition less knowledgeable than Ray. As the engineer informs his surviving men (those on the half of the tanker that remains afloat at movie's start) that they will need to run the ship aground in order to manage even a sliver of a chance, Bernie is on a 36-foot wooden boat, with a three-man crew, unaware of where the tanker he might be or whether the men on that tanker might be alive. He's lost his compass and they've lost their radio: how can these two heroes possibly find one another? The true story being what it is, their meeting is foregone. But until that point, late in the film, the two head toward one another inexorably, only occasionally and briefly daunted by weather, contrary bosses or colleagues and, in the case on Bernie, his fiancée Miriam (Holliday Grainger). It's not that Miriam has much say in what he's doing, as once his commander, the apparently incompetent Warrant Officer Daniel Cluff (Eric Bana), sends him off on this preposterous undertaking. "Pick yourself a crew," Cluff orders, which will include volunteers who aren't precisely convinced of the soundness of the mission or Bernie's ability (he's provided with a bit of a backstory and a need for redemption). Miriam's part is to point out this bad decision, repeatedly, and then to discover the backstory, so that you might share her earnest desire to see Bernie return. In this, Miriam is utterly traditional, both helpless and full of moxy. When Cluff -- as he must -- rejects her demand that he bring the boat back, she strides forcefully from the Cape Cod Coast Guard station without her winter coat and drives straight into a snow drift, occasioning her need of rescue by someone who conveniently reveals why Bernie, renowned as "a good man", is so determined to do his job and to follow rules. These long moments with Miriam are spent on the phone (she's a telephone operator, and so she has unusual access to this technology), on the road, stamping her foot, and eventually, waiting on shore into the night, assembled with the rest of the locals, who also appreciate the difficulty of being a government sailor. Miriam's waiting takes up time in the film, as does Bernie's relentless forward motion over waves reminiscent of those that overwhelmed George Clooney and Marky Mark in The Perfect Storm. Repeatedly, the future looks dreadful -- giant crests, black skies, thrashing rains -- and repeatedly, he presses ahead (or what looks like ahead), despite reasonable suggestions by crewmember Livesey (Ben Foster) that they turn back. It looks crazy, given the grimly spectacular special-effected storm, but also, of course, admirable. As much as the young men on the boat loathe Cluff and blame Bernie, they eventually respect his selfless aspiration to save the tanker's crew. Even if, you know, that crew is no longer around. But you do know the crew is around, and they're desperate and hoping against all odds that someone, anyone, even someone with a 36-foot boat, will happen along and get them off their creaking, sinking hulk. You know because the film cuts back to Ray and company repetitively, a storytelling strategy that breaks up emotional rhythms and provides clumsy reminders of the multiple hazards in play. As wet and bedraggled as Bernie is, as broken as his boat becomes, and as tiny as the vessel looks on screen, compared to what Ray is going through, he has an easier time of it. As Bernie acts, against common sense but in line with gallant ideals, Ray bears the burden of knowing and waiting. With the captain suffering an ignominious end early end, the men turn to Ray for answers, none of which are remotely good. As much as Ray explains what's happening and what precious few options they have, some guys turn their anger and frustration on him. It's understandable, he tells them, but not helpful or practical. Jerry-rigging an unwieldy rudder, Ray gets the men busy, steers the tanker to a likely location for grounding -- a plan that involves quite a bit of waiting. Ray's face sags but his eyes remain almost unbearably bright. It's not long before you realize that Ray's eyes tell their own story, more hauntingly and more urgently, than any of the plot's clunky machinations.